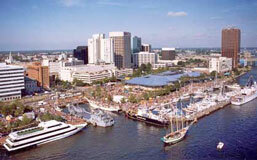 Norfolk is a popular port for cruise ships, with over 100,000 passengers sailing from Norfolk on cruises. Cruise ships dock at the new cruise terminal on the downtown waterfront. Parking is off-site; drop your luggage at Nauticus before you park. Porters will take your bags. The ships sailing from Norfolk are listed below. The individual ship pages include the complete sailing schedule. Hotels near the cruise terminal. 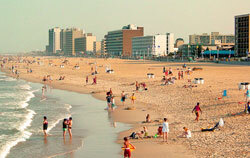 Go to our Norfolk VA guide more information about visiting Norfolk. Cruise Norfolk VA ... you'll be glad you did. NorfolkVisitor.com has all the latest information about Norfolk cruise departures. Carnival Cruise Lines Carnival Sunshine sails from Norfolk to the Bahamas. Royal Caribbean doesn't currently have any cruises sheduled to depart from Norfolk, but stay tuned, they may be back.